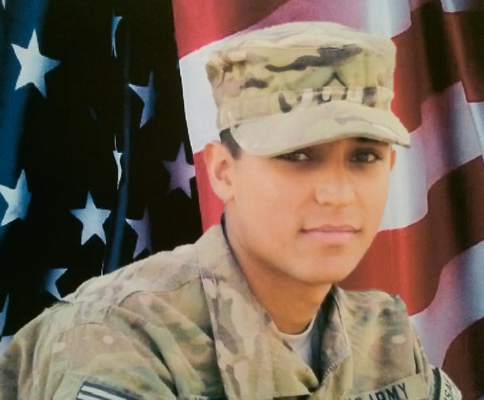 PFC Jalfred David Vaquerano was born 1/20/91 in Brooklyn New York and was raised in Lancaster MA. He graduated with honors from West Oaks Academy, Orlando, Florida. By the age of 15, he had decided that he wanted to serve his community by pursuing a career as a police officer. To fulfill his dream, he joined the Army on January 2011 at the age of 19 following his older brother Carlos J. Vaquerano footsteps pledging his oath to the USA in the city of Tampa, Fl. In which he planned to returned to fulfill his duty as a correctional officer. He completed his basic training at Fort Benning, Georgia in 2011. Immediately, after basic training, he was assigned to the Company D, 1st Battalion, 41st Infantry Regiment, 3d Brigade Combat Team, 1st Armor Division Fort Bliss, Texas. He was deployed to CCOP CHARKH, Logar Province, Afghanistan in the summer of 2011. On December 10, 2011, he was shot on the head by enemy small fire arm. Three days later on December 13, 2011, he died from the wounds he sustained. His awards and decorations include the Bronze Star, Purple Heart, Army Achievement Medal, National Defense Service Medal, Afghanistan Campaign Medal, and Global War on Terrorism Service Medal, Army Service Ribbon, and NATO Medal. His final resting place is at Section 60 8927 at Arlington National Cemetery, Virginia.